Well the names have all changed since you hung around, But those dreams have remained and they're turned around. Yeah we tease him a lot cause we've hot him on the spot, welcome back, Welcome back, welcome back, welcome back. 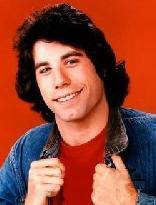 During the 1970s, the catchy theme song from Welcome Back, Kotter (composed and recorded by John Sebastian of Lovin' Spoonful fame) was heard frequently on American television and on the radio. 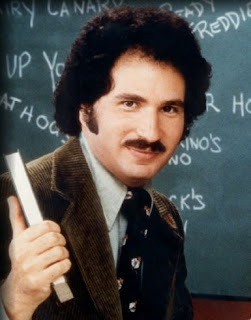 It was Gabe Kaplan, along with fellow Brooklyn native Alan Sacks, who created the situation comedy about a teacher who returns to teach at the same high school he had attended as a student a decade ago. Kaplan, of course, played the wise-cracking teacher, Gabe Kotter. The series was based on Kaplan's experiences as a student in a remedial class at New Utrecht High School in Brooklyn. It ran for four seasons on the ABC network, from September 9 1975 until June 8, 1979. 95 episodes were produced. Gabriel "Gabe" Kaplan was born in Brooklyn, New York on March 31, 1944, the son of Charles and Dorothy Kaplan (Dorothy died on December 23, 2000 at the age of 85). Since boyhood, Gabe aspired to be a Major League baseball player. Although good enough to be invited to the training camp of the San Francisco Giants in Florida, young Kaplan failed to make the roster of any minor league team. He eventually found employment as a bellman at a New Jersey hotel where he watched comedians perform. After deciding to become a stand-up comic himself, he developed a routine based on his childhood experiences in Brooklyn. During the early 1960s, he honed his skills at nightclubs and coffee houses in New York City and then later toured the United States with his act. Kaplan's tour succeeded in getting him public recognition and the attention of talk show host Johnny Carson. The up-and-coming comedian get his big break when he made five appearances on The Tonight Show Starring Johnny Carson during the early 1970s. He performed on other talk shows such as The Merv Griffin Show and by the mid-1970s, he was the star of his own hit television series, Welcome Back, Kotter. 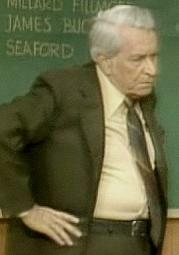 Kaplan's character, teacher Gabe Kotter, sometimes regaled his students with corny jokes beginning with ""Did I ever telll you about my Uncle So-So?" and also with Groucho Marx impressions. In those days, Kaplan resembled Groucho somewhat with his dark curly hair and his prominent moustache. 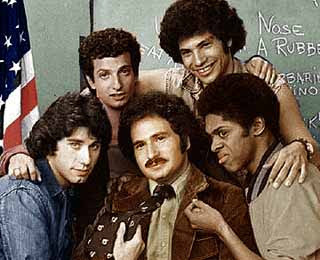 Mr. Kotter taught a remedial class at James Buchanan High School, a fictitious school located in the Bensonhurst section of central Brooklyn (The front and back views of Kaplan's actual alma mater, New Utrecht High School), are shown in the opening sequences of the show). Kotter's students included a motley crew of misfits known as the "Sweathogs" (He was once a Sweathog himself). This group of underachievers was led by the sardonic Vincent "Vinnie" Barabino, played by a young John Travolta who was only 21 when Welcome Back, Kotter premiered. Travolta remained with the show even after becoming a major film star with the release of Carrie in 1976, Saturday Night Fever in 1977 and Grease in 1978, although by 1978 his Vinnie Barbaino character was only seen sporadically. Barbarino was a cool, tough Italian-American whose favourite catchphrase was "Up your nose with a rubber hose!." The three other major Sweathogs were a hip African-American named Freddie "Boom Boom" Washington (Lawrence Hilton-Jacobs), the dim-witted Arnold Horshack (Ron Palillo) and Juan Epstein, a proud Puerto Rican Jew (Robert Hegyes). 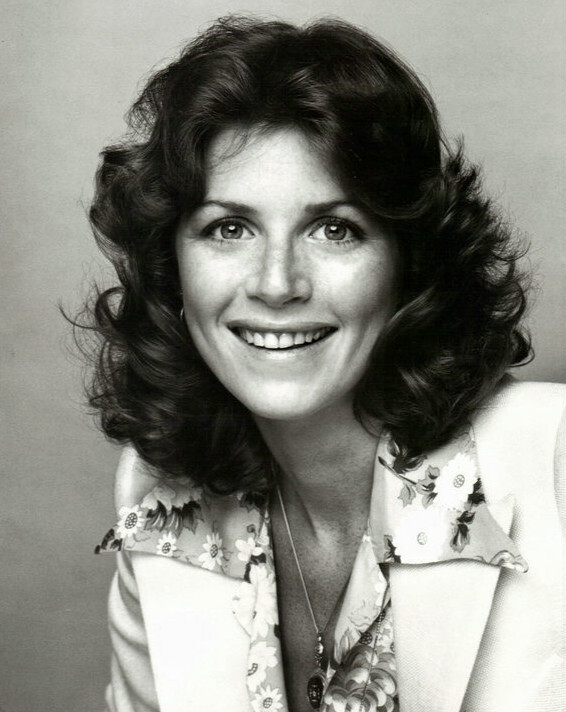 Kotter's wife, Julie, was played by Marcia Strassman. At the end of the 1976-1977 season, Julie becomes pregnant. At the start of the next season, in the fall of 1977, she gives birth to twins, Rachel and Robin Kotter. By the fourth and final season of the show in 1978 -1979, the Sweathogs were well into their 20s and not too believable as high school students. Travolta, the youngest of the group at 25, was a superstar with a blossoming film career. After Welcome Back, Kotter left the air in 1979, Gabe Kaplan returned to his stand-up comedy routine, performing in Las Vegas and Atlantic City. He also appeared in three feature films: Fast Break (1979), Tulips (1981) and Nobody's Perfekt (1981). In addition, he portrayed Groucho Marx in Groucho, a touring stage show.based on the life of the flamboyant comedian. Of his performance as Marx, Kaplan told the Milwaukee Sentinel,. "I am not trying to play the stage Groucho. I am trying to do the person he was in real life." Grooucho was later filmed as an HBO special. In 1981, Gabe returned to weekly television in a short-lived situation comedy on NBC called Lewis & Clark. He created the series in which he starred as Stewart Lewis, a native New Yorker who decides to pursue his dream of owning a country and western club. Stu and his family - wife Alicia (Ilene Graff) and two children - move to the sleepy Texas town of Luckenback where Stu opens the Nassau County Cafe, named after the New York suburb he left behind. The club is managed by a smiley hick named Roscoe Clark, played by Guick Koock. Lewis & Clark was cancelled due to low ratings and only 13 episodes of the series were produced. The last episode was broadcast on July 30, 1982. It is interesting to note that two former Sweathogs, Robert Hegyes and Lawrence Hilton-Jacobs, reunited with Gabe Kaplan as guest stars in an episode of Lewis & Clark entitled "The Uptight End" (Season 1, Episode 5, Air Date: December 12, 1981). In a 1984 episode of Murder, She Wrote, the popular mystery series starring Angela Lansbury, Kaplan played the role of nightclub entertainer Freddy York. The episode is entitled "Birds of a Feather" (Season 1, Episode 2, Air Date: October 14, 1984). Among his many talents, Gabe Kaplan is an expert poker player. 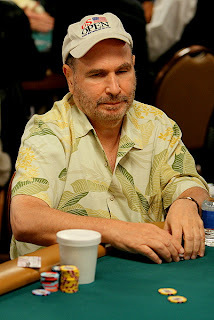 In 1978, he made his first appearance at the World Series of Poker. Since then, he has been a contestant in numerous poker tournaments and has won a considerable amount of money. Gabe has commentated at live poker events and on televised poker programs such as the National Heads-Up Poker Championship on NBC. He has also served as co-host and joint commentator along with A.J. Benza on High Stakes Poker on GSN. In January of 2011, however, GSN replaced him as co-host with another stand-up comedian, Canadian Norm Macdonald. * Five days from now, on March 31st, Gabriel Kaplan will celebrate his 69th birthday. * Ron Palillo, who played nerdy Arnold Horshack on Welcome Back, Kotter, died of a heart attack in Florida on August 14, 2012. He was 63 years old at the time of his passing. * Robert Hegyes, who portrayed Juan Epstein, died of cardiac arrest in Edison, New Jersey on January 26, 2012. He was 60 years old. * Marcia Strassman, who portrayed Julie Kotter, went on to star opposite Rick Moranis in the 1989 Disney comedy Honey I Shrunk the Kids. She played Diane Szalinski, the wife of Moranis' character, wacky inventor Wayne Szalinski. Strassman, now 64, was diagnosed with breast cancer in 2007 and has spoken out about breast cancer awareness. * John Sylvester White, who played Vice Principal Michael Woodman at Kotter's school, died of pancreatic cancer in Waikiki, Hawaii on September 11, 1988. He was 68 year old. * Gabe Kaplan has a daughter, Rachel, from a relationship with a woman whom he has not publicly identified. Rachel was born circa 1990. To view a 2007 photo of Rachel and her father in Las Vegas for the CineVegas film festival, click on the link below. To watch a video of Rachel Kaplan's first try doing stand-up comedy in 2010, click on the link below. * Other alumni from Gabe Kaplan's Brooklyn high school, New Utrecht High, include Moe and Curly Howard of the Three Stooges, comedian Buddy Hackett and record and film producer David Geffin. * Gabe was inspired by a Miss Shepard, his teacher at New Utrecht High School. * In 1977, when Welcome Back, Kotter was at the height of its popularity, Gabe was invited to the White House to meet then-president Jimmy Carter. When they met, Carter said, "Mr. Kaplan, nice to meet you. And when you go back to California, say hello to the Groundhogs." * In 1976, Gabe Kaplan was the captain of the ABC team in The Battle of the Network Stars. He outraced NBC captain Robert Conrad of The Wild Wild West in a showdown sprint to the finish to determine the final winner. Hosted by Howard Cosell, it is vintage 1970s television. To watch a video of The Battle of the Nework Stars 1976, click on the link below. 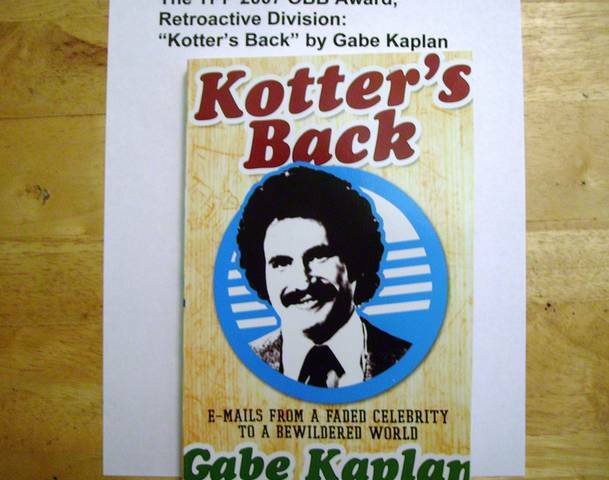 * Gabe Kaplan is the author of a book entitled Kotter's Back: E-mails from a Faded Celebrity to a Bewildered World. The book is a humorous collection of correspondence reacting to Kaplan's prank e-mail campaign. It was published in 2007. 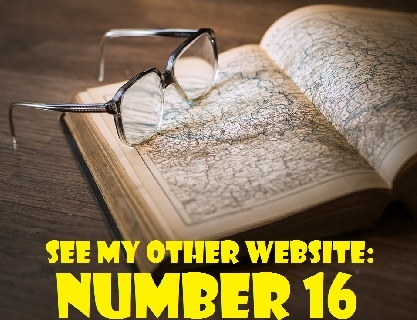 * For one week in May of 1976, John Sebastian's recording of the theme from Welcome Back, Kotter topped the Billboard Hot 100 chart. To watch a video of the opening theme from Welcome Back, Kotter, click on the link below. (It provides a good view of Brooklyn in the 1970s. Watch for New Utrecht High School.